As a member of Better Health Network of medical bloggers, I had an opportunity to participate in a briefing on bisphenol A (BPA) in December. You can listen to the briefing read up about issues surrounding BPA here. This is an important story which will probably receive more attention as we learn more about the safety of BPA. On Friday, the FDA changed its position regarding BPA over concerns about the chemical which is used in a wide range of consumer products from water bottles to baby bottles. The FDA is now expressing its intent to seek and fund more studies on the public health safety of BPA. The BPA story has been a long-running controversy and provides us with a good view of the intersection of public health, scientific rigor, commercial enterprise, government regulation, the spread of memes via social media and the economic consequences of public policy. If it turned out, on solid scientific grounds, that BPA does indeed pose a threat what would be the economic consequences of revocation and remediation? This isn’t to equate money with life or health – but it is a point about the important role that scientific rigor has in how we produce goods. In an age of instantaneous propagation of information (either good or bad), how do we filter out the right data from the wrong? Additionally, given that public debates are necessarily human in nature (that is to say, emotional), how do we ensure that reasoning minds appropriately congregate so we achieve the clearest results? What do you think of the FDA’s change in stance with respect to BPA? Do you think public debates on matters like BPA safety are healthy? Is Twitter safe and effective? Several years ago, as a second-career registered nurse practicing critical care – having a prior background in enterprise working with fairly sophisticated information technologies – it was all too easy for me get frustrated with paper medical records and laboratory reports laying in floors drenched in Clostridium difficile. How was it possible in the 21st Century that the informational flows in healthcare facilities could end up on contaminated floors? Surely, I thought, there must be technologies within our grasp that could spare us – our patients and the staff – such dangerous indignities. I can’t remember where I was when I first heard of Twitter, but I was one of its early adopters. It occurred to me that Twitter’s essential feature – the power to share data instantly and briefly – was worthy of consideration in health care. But my early ideas about invoking Twitter into healthcare faced two hurdles: HIPAA always got in the way of my thinking and nobody else I knew at the time ever heard of “a Twitter”. After Twitter deleted my first account, I gave up on the incompetent service. When I returned to Twitter sometime in early 2008, the use of Twitter (or any other social medium for that matter) in healthcare was still relatively unheard of. Part of the reason I started blogging was to fill a relatively empty void in the healthcare social media space. Today, I believe we are seeing that space filling with more important voices. Since publishing 140 Healthcare Uses of Twitter in January, hundreds of hospitals have started up Twitter accounts. Every day we hear about Twitter’s role in health care, from disaster management to surgical live-tweeting. So far, the word is largely positive concerning the experiences of a relatively small number of hospitals on Twitter. But has Twitter gone through the strainer, the one beyond the marketing and PR uses? I’m not so sure but I’m hopeful. Time and the further adoption of the service will tell us more about its safety and effectiveness. A purpose of the list I published in January was to start a discussion about how micro-messaging technologies like Twitter could be used in health care. Twitter’s fame and hype continue to skyrocket and health care is one of the hottest topics of our time. I have no doubt now that micro-messaging and health care are important partners. My task then was to be an evangelist in a time of sparse awareness. The questions now are how far we will go with these technologies and what kinds of challenges and fears we are willing to face and overcome. For as much as Twitter is now being examined by the healthcare and pharmaceutical industries (a welcomed step), we have yet to flesh out practical opportunities and dangers Twitter poses for them. I am encouraged that hospitals are tweeting. Some are doing remarkable work and learning as they proceed. But I also have concerns about the incorporation of Twitter in the healthcare setting. I know all too well about Twitter’s seductions. Twitter makes almost everything easy, including regret. I have therefore assembled a collection of dark predictions about how Twitter may be misused or misappropriated. My task now is to be Devil’s advocate during a time of attention obesity. I don’t know if I saved Follow Friday. I do hope that in the rush to embed Twitter into our daily lives that we strike the right chords between Twitter Evangelism and Devil’s Advocacy. That physician you’re following on Twitter will turn out to be an impostor. Your Direct Message will FAIL. Horribly. Your organization/practice will violate HIPAA. Repeatedly. Patients who don’t fully understand Twitter’s viral powers will find themselves woefully embarrassed. Your surgeon will tweet the wrong body part. Disaster management will be a disaster thanks to spam. Pandemic alerting will be a mess thanks to spam, panicked retweets, amateur microbiology and the Baumann Uncertainty Principle. Twitter will never reserve hashtags for sole use by the CDC or FDA or any other public service to guard against spam and keep channels of authority clear. Big Pharma will pay out tens of billions of dollars in fines and civil lawsuits related to alleged misleading statements in the course of tweet-marketing. Pharmaceutical company Twitter accounts will be hacked and the exploits will tweet misleading drug information, malicious links, confidential legal settlements and other embarrassing material. Twitter’s curious effects on Dopamine will lead to addictive behaviors interfering with activities of daily living. Some disappointed healthcare marketers will revert to the traditional broadcast model of marketing after realizing quarterly earnings aren’t immediately boosted by providing free value to the communities they serve. Twitter will accelerate the proliferation of self-diagnoses. Insurance companies will find and track patients by viewing the follow lists of public-timeline hospital Twitter accounts. Insurance companies will set up dashboards to monitor insureds and use the information profitably. Twitter chats about healthcare reform will be infiltrated by Townhall-like Hashtagging. Patient dignity will be violated by nurses and doctors who tweet about their shifts from hell. Big Pharma and medical device companies will pay out tens of billions of dollars in fines (again) years after the FDA decides what regulatory rules to impose on tweeting. Lawyers will set up dashboards to monitor the tweets of pharmaceutical companies, device manufacturers, doctors and healthcare organizations in search of opportunities. Big Pharma will find itself finally engaging with patients on Twitter, only to realize that having 1,550,000 followers on Twitter means having to employ armies of drug safety associates 24/7/365. Twitter chats around specific disease processes will be polluted not only with spam but also misinformation masquerading as evidenced-based medicine. Patient-provider boundaries will be broken at alarming rates. During a live-tweeted procedure that goes wrong, staff will forget to personally attend and inform the family reading the tweets. Privacy settings in Twitter will be reset to public, either by a Twitter glitch or hack or user-error and patient data will be inadvertently published. Psychotherapists using Twitter to communicate with patients will misinterpret or miss a patient’s tweet, resulting in a suicide. Hospital staff will tweet out information related to an incident. 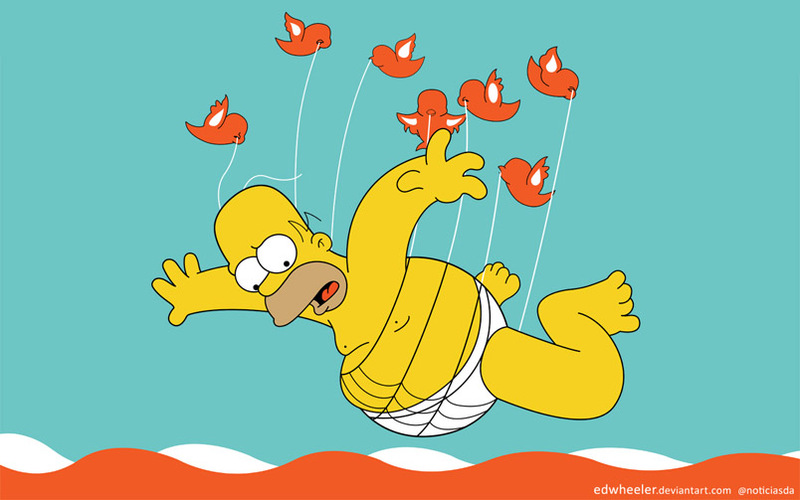 The overuse of Twitter will increase hypomania in patients with bipolar affective disorder. Obesity will continue to proliferate as healthcare consumers spend more time on Twitter looking for diet and exercise tips. Tweeters expressing suicidal ideation will be trolled by malicious malcontents. The wrong kind of medical crowdsourcing will lead to the wrong diagnostic judgements. Nurses who are not accustomed to the safe use of clinical micro-messaging will be distracted from their bedside duties. Doctors in facilities that employ enterprise micro-blogs may issue the right order to the wrong patient. The wrong laboratory results will be mis-tweeted. Fortunately, a smart nurse will notice the discrepancy between the lab value and the patient’s signs. This time. Patient timelines in facilities using micro-sharing technologies will be confused, causing all sorts of mayhem during shifts. The tweets of doctors will be used in courts to contradict testimony regarding timeline claims. The content of doctors’ tweets will be compiled and analyzed to challenge their competencies. Twitter chats about Obsessive-Compulsive Disorder will never end. Twitter chats about Obsessive-Compulsive Disorder will never end. Twitter chats about Obsessive-Compulsive Disorder will never end. Twitter chats about Obsessive-Compulsive Disorder will never end. Twitter chats about Obsessive-Compulsive Disorder will never end. Nurses will lose their jobs for posting TwitPics of patients in undignified positions. Family members will stick their unsolicited noses in each others’ health matters. CDC will inadvertently create panic during a major outbreak after a single malformed tweet is retweeted relentlessly. CNN and Fox News, confusing Twitter with sourcing, will re-broadcast the tweet, fueling more retweets and distortions of the original tweet. Small practices using Twitter for scheduling will tweet the wrong patient or time. Hospitals will monitor their staff’s Twitter streams for violations of confidentiality and other reasons for discipline or termination. Hospitals who don’t understand the subtle dynamics of Twitter-sociology will find themselves in front of public relations nightmares. Healthcare information consumers will be under-served by over-reliance on 140 characters, especially by organizations that don’t have a well-rounded social presence on the web. Hospital administrators will tweet annoying requests to staff busy with more important tasks. In a maternity ward, somewhere in the Midwest, the grandparents of twelve girls will read a tweet saying “It’s a boy!”, only to find out someone saw something that wasn’t there. A drug guide application accessible via Twitter’s API will tweet back the wrong dosage information. Shortly after retweeting the funniest thing she ever read, a newlywed will find out about her husband’s STD. Pharma will receive an unprecedented volume of Warning Letters for its uses of Twitter. A pharmaceutical company will inadvertently issue a drug safety alert about the wrong drug, resulting in billions of dollars in lost sales with a single tweet. A pharmaceutical company will not issue a drug safety alert, resulting in billions of dollars in lost sales with a single tweet. The FDA will issue a drug safety alert about the wrong drug, resulting in billions of dollars in lost sales with a single tweet. Practices using Twitter for patient care reminders will mix up patient Twitter accounts, causing confused home-care. A psychiatrist being sued for breech of confidentiality on Twitter will be relieved when she discovers that Twitter’s search engine no longer returns her troublesome tweet. Unfortunately for her, the lawyer suing her will find the tweet on FriendFeed’s search. Hospitals who should be blogging or otherwise investing in a larger social media landscape will over-invest in Twitter, since everybody has Dopamine receptors (see #11). Segments of the health care population who aren’t using Twitter will be overlooked or under-served. Allied care coordination, will be hampered by confusing tweets. Patients will increasingly realize that they can tweet adverse events on Twitter. 4Chan will catch on to this too. The big heart of a near-retirement CEO in Big Pharma will enter ventricular fibrillation. He will survive and will be prescribed the medication fictively referred to in #52. David will become internet famous during the next major infectious outbreak. The public, unaware of @CDCemergency, will go to the most logical Twitter name for CDC: @CDC. The confusion will lead to the conclusion that CDC is not on Twitter and will turn to bogus accounts and spammed hashtags for updates. This oversight by CDC and Twitter will go down as one of the biggest failures to capitalize on brand equity. The FDA will finally issue guidance allowing pharmaceutical companies to tweet links to products. Curiously, the FDA will encourage those tweets to be “non-retweetable”, stating that it will use its discretion in fining companies $10,000 for each retweet if, in the FDA’s opinion, the tweet appears “overtly re-tweetable”. The FDA will allow healthcare applications to be built on Twitter’s API. What’s more, the FDA, in its recognition of the importance of real-time technologies in our daily lives, will outline an efficient seven-year approval process for each application. Remarkable healthcare applications will be built on top of Twitter’s API, spurring wider acceptance of Twitter in serving the health care needs of the public. Unfortunately, Twitter will make unannounced changes in its API. Jesse Stay, having helped to develop one of the most downloaded Diabetes iPhone apps, will suffer a brain aneurysm while discussing the changes with Twitter. He will survive and recover but will go on to delete his Twitter account and give up application development. The FDA, realizing Twitter’s role in public health, will require pharmaceutical companies and device manufacturers to publicly tweet Serious Adverse Events within 24 hours of receipt of notification. The hypothetical executive referred to in #59, in an extraordinary episode of psychosis, will go postal and use Twitter to live-tweet his rage. From that day onward, the phrase “going postal” will be replaced by “going Twitter”. HIPAA will be repealed and replaced with the Health Insurance Tweetability and Liability for Electronic Records Act of 2010. Among the provisions is the requirement that hospitals with public Twitter profiles not display their Following and Followers on their accounts. Twitter, of course, will offer no way to do this. Highlighting the power of Twitter’s monopolistic communications platform after a series of national health emergencies and a major terrorist attack coordinated in part via Twitter, the U.S. Congress will pass the Public Health And Safety Communications Act of 2012. Twitter Inc. is deemed a public utility holding company and enters an indefinite licensing agreement with the Department of Energy, whose charge is “to ensure the safe and uninterrupted use of Twitter and other micro-messaging services during times of national and international crises”. Twitter’s long-standing liquidity issues are finally resolved. That last prediction may be the most dramatic, but given the tenuous state of our world’s psyche, it’s not far-fetched. Would it surprise you if it happened? Am I being sarcastic or serious here? Does it matter? I mean: if we are to put safety and effectiveness above all else, shouldn’t we plumb the dangers posed by a real-time web? Here’s another way to look at this list: as implied solutions to problems we may not have considered. Nothing is necessarily inevitable – awareness can prompt avoidance. Twitter is telephony. Twitter is telepathy. Twitter is good. Twitter is bad. Twitter is useless. Twitter is useful. Twitter is whatever you make of it. Twitter’s uses in Healthcare or Pharma or Politics or Marketing or any other field don’t so much depend on the technology as much as our willingness to be creatively courageous in the face of rapid change. How we use Twitter in healthcare to streamline clinical operations, to provide richer experiences for consumers of healthcare information and to effectively propagate critical messages in times of crises depend on how willing we are to re-examine our traditions and re-envision what remarkable health care looks like given our new powers. We need leaders who aren’t afraid to break stupid rules and flush out deep prejudices. In healthcare and other life sciences, following the rules is a vital part of the game. In fact, it usually is the game. Which is to say: leadership in healthcare is uniquely risky business. What do you think are the dangers of real-time social communities in healthcare? How would you propose we overcome those dangers? What are the rescuing elements among evolving – and sometimes unpredictable – threats from social technologies? The recently popular blog post 140 Health Care Uses for Twitter is now available as a free eBook that you can view, embed or otherwise share using the tools in Slideshare below (hover over the link below or click on it to be redirected to SlideShare where you view the file). Twitter may either be the greatest prank ever played on the internet community or it may be the best thing since sliced bread. It’s easy to make the first case if you read the public timeline [now defunct] for a few minutes. It’s a bit harder to make the second case, but I’ll do my best to make it. Specifically, I’d like to take a stab at offering 140 health care uses for Twitter. Twitter’s simplicity of functional design, speed of delivery and ability to connect two or more people around the world provides a powerful means of communication, idea-sharing and collaboration. There’s potency in the ability to burst out 140 characters, including a shortened URI. Could this power have any use in healthcare? After all, for example, doctors and nurses share medical information, often as short bursts of data (lab values, conditions, orders, etc.). The possibilities that I believe Twitter offers currently far exceeds the constraints. I won’t offer work-around solutions to these constraints in this post. I want to focus on the possibilities because once we see the potential, we may have stonger motivations to deal intelligently with the constraints. So when reading this list, don’t get hung up on the details, the fears, the anxieties that may be provoked by the realities of health care as it is practiced today. It’s the 21st Century: let’s be imaginative, determined and innovative. Let’s be remarkable. In the health care industry there is often a fine line between caution and fear. It is the fear of change so common in health care that I hope we can overcome. Twitter may be a proving ground of how we overcome our fears, satisfy our cautions and extend the reach of our health care system with web-based technologies and communities. What follows are uses than can be adopted right now and uses that remain to be developed. What do you think health care will look like in 2099? Will we still be using paper medical records or will we be using technologies that other industries use? Will we transcend our accustomed ways of thinking and re-socialize ourselves for how we interact with each other in an exponentially changing technoscape? I hope this list sparks debate to help answer those questions. Here are the suggestions. There they are: 140 health care uses for micro-sharing platforms like Twitter. Implementing these uses can be enormously challenging (and even impossible) on Twitter given today’s constraints. For many of these uses, other more robust and secure micro-sharing platforms will be needed (e.g. Yammer or ESME). Certainly, Twitter offers a model of how micro-sharing can be used for a wide range of purposes. If social media marketers can figure out how to use Twitter, health care professionals can also figure out how to use micro-sharing. With 26 letters in the alphabet arranged within 140 characters, there are over 1.2 x 10^198 possible character combinations (thank you @symtym). Of course, the number of meaningful sentences is far less than that but a point stands out: there’s a virtually infinite number of short pulses of (meaningful) information that Twitter can facilitate. With that kind of power, health care should be a leader in micro-sharing, not a lagger. WHAT HAVE I MISSED? WHAT CAN YOU CONTRIBUTE? I have probably missed some incredibly important healthcare uses for Twitter. I am also probably missing specific Twitter accounts that should be included as links in the list. Please contribute and I will continue to refine the list. Visitors: please add to the list, make comments, ask questions, offer critique. It’s your health, it’s your century and it’s your right and responsibility to make this list as practical as possible. I’m doing my best to do my part. Your turn. Download the eBook version of this post.